Explore Santiago de Compostela's surroundings by going to La Coruna (Monte de San Pedro, Tower of Hercules (Torre de Hercules), & more) and Islas Cies (in Vigo). There's lots more to do: take in the spiritual surroundings of Cathedral of Santiago de Compostela, pause for some serene contemplation at Church of Santa Maria la Real del Sar, grab your bike and head to Vista Galicia - Day Tours, and tour the pleasant surroundings at Mirador Parque da Alameda. To see other places to visit and tourist information, refer to the Santiago de Compostela trip maker website . Barcelona to Santiago de Compostela is an approximately 4-hour flight. You can also do a combination of flight and train; or drive. Prepare for a bit cooler weather when traveling from Barcelona in August: high temperatures in Santiago de Compostela hover around 28°C and lows are around 15°C. Finish your sightseeing early on the 23rd (Thu) so you can drive to Fisterra. Fisterra is a municipality in the province of A Coruña, in the autonomous community of Galicia, Spain. On the 24th (Fri), get great views at Mirador Ezaro, then stroll through Playa Mar de Fora, then enjoy the sand and surf at Playa Lagosteira, and finally visit a coastal fixture at Faro de Fisterra. To find photos, other places to visit, maps, and other tourist information, read our Fisterra driving holiday website . You can drive from Santiago de Compostela to Fisterra in 1.5 hours. Other options are to take a bus; or do a combination of train and bus. In August, daytime highs in Fisterra are 29°C, while nighttime lows are 15°C. Wrap up your sightseeing on the 24th (Fri) to allow time to drive to Ribadeo. Ribadeo is a municipality in the Spanish province of Lugo in Galicia. 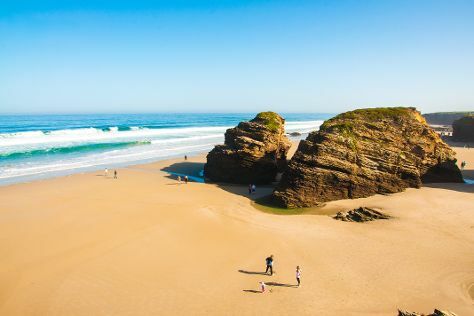 Kick off your visit on the 25th (Sat): don't miss a visit to Illa Pancha and then enjoy the sand and surf at As Catedrais Beach. For maps, photos, and more tourist information, use the Ribadeo tour app . You can drive from Fisterra to Ribadeo in 3 hours. Alternatively, you can take a bus; or do a combination of bus and train. August in Ribadeo sees daily highs of 27°C and lows of 17°C at night. Cap off your sightseeing on the 25th (Sat) early enough to travel back home.